Price is per 1000. Minimum order of 1000. 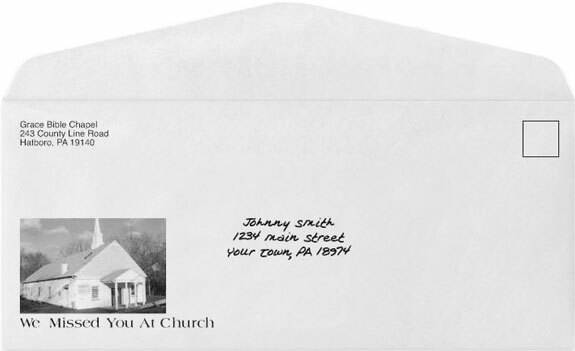 Custom printed, #10 business sized, white envelopes with a photo of your church, plus your slogan or memorial. Printed with black ink. Envelopes measure 4 1/8 inches x 9 1/2 inches, closed, and have an easy open flap. Pricing includes printing, white envelopes per thousand (EX: Ordering a quantity of 1 = 1000 envelopes, 2 = 2000 envelopes, etc.) and basic setup from properly supplied files. Use to mail out attendance reports, missed lessons, church bulletins and announcemets. Perfect for mailings on your letterhead. Minimum order of 1000. Artwork Formats: We accept files in InDesign, PDFs with embedded fonts, Illustrator, QuarkXpress, Word, Publisher and PowerPoint. We will accept JPEG files if the resolution is 300 dpi at 100%. Files supplied in Word, Publisher and PowerPoint will cost an additional $25.00 conversion charge per color. We must have 1/4 inch plain white border at each edge of envelope. We will notify you of any extra costs for correcting supplied artwork prior to production. Any artwork takes an average of 1-3 business days. For reprints, art files will be held for no more than two years. Proofs will not be generated until the order has been placed and payment is received. PMS mix for colors other than black is $30.00 per color. Authors changes are $60.00 per hour with a $30.00 minimum. Printing over 2 colors or quantities over 25,000 require custom pricing. Supplied files printing in more than 1 color may incur a charge if not created with the proper color break down. Feel free to call our Customer Order Specialists at (800) 322-6203 if you need help regarding the printing process and requirements to print a file. Production Time: 6-9 working days from written proof approval. Proofs: A pdf proof will be emailed to you for final proof approval. If you require a hard proof mailed to you please call our Custom Order Specialist at (800) 322-6203, after placing your order. Ink Options: 1 colored ink (in place of black) is available at an additional cost of $30.00. Numbering: Set up charge is $50.00 plus $35.00 per 1,000 envelopes. Personalization and Numbering: Personalized name, addressing and numbering: $98.00 Setup plus $35.00 per 1,000 envelopes. (Minimum 1,000.) Files must be supplied in Excel. 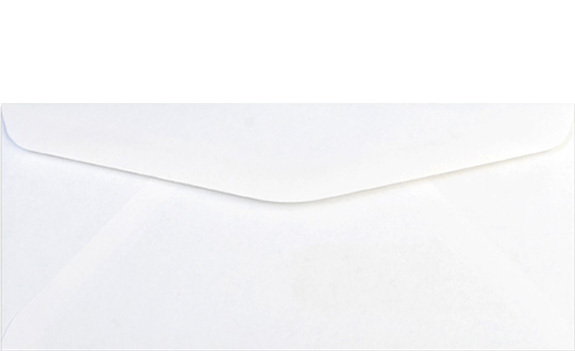 We also provide Monthly, Bimonthly, Quarterly and Yearly Envelope Mailings. Please Note: Shipping incurs additional charges. Shipping time and cost varies on type of delivery, location of delivery and weight of your order. Sending Us Your Artwork: You can e-mail your artwork to: custom@churchsupplier.com or you can upload your artwork to our FTP server. Call us today at 1-800-322-6203 to order!